Do you need any pieces for a certain date? Not necessarily, but would like them soon. If yes, what date and what is the occasion? What issues have you had with clothing? Do you have any questions about what we do? *including underwear, bra, binder, packer, etc. Wear the shoes you plan to wear with any pants, long dresses, skirts, or other long garments you’re having altered. Expect a body positive environment at Sweetlime Alterations. 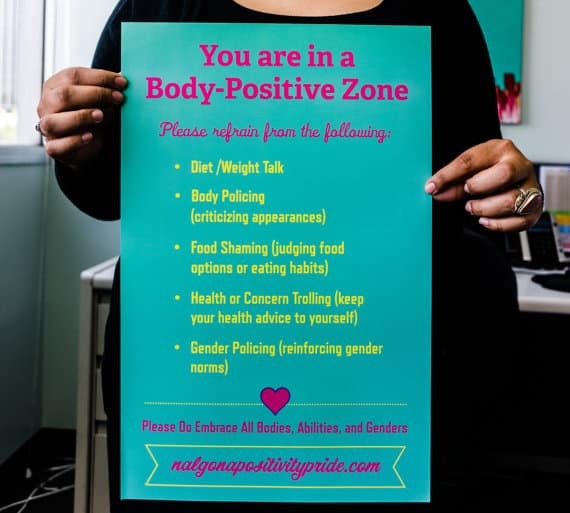 Two copies (one in English, one in Spanish) of the Body Positive Zone poster above hang at Sweetlime Alterations.